And she's desperate for her father's love. May be the one she needs to hold. Than outside in the cold. And the cast get eaten by the play. There are dead men in the aisles. ...But the frozen mask just smiles. 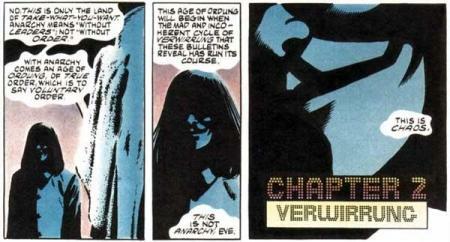 Alan Moore and David Lloyd's grim, bold, rousing V for Vendetta (written 1981-8, published by DC 1988/1989) was - like so much of Moore's work - a seminal moment for comic-book writing. It is a stark vision of (what was then) the future, dripping with the claustrophobic despair of 1984 but filtering its phoenix-from-the-flames variety of hope through two quite unique characters: Evey, a scared 15 year-old orphan and (when we first meet her) would-be prostitute; and V, masked man of mystery and much alliteration. The art is suitably brooding, heavy on the shadows and sharp angles (with Evey's hair, while she has it, providing a rare splash of brightness and curvature). Sunlight barely gets a look in (and even when it does, the colour seems off); most of the action takes place at night, or in confined indoor spaces, lit only by the glare of video screens or half-glimpsed street lamps. 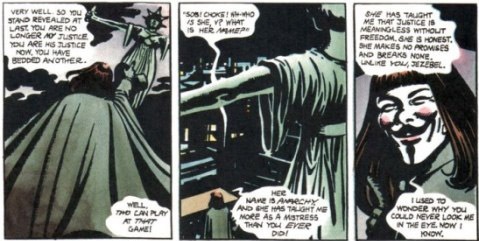 The focus of the panels lingers again and again upon individuals in the extremes of their isolation: Evey in her cell, Finch having his silent crisis of faith, Delia Surridge waiting for V to come and kill her, Rosemary coping with widowhood in the only way she can, even dictator Adam Susan, seeking vainly to commune with the Fate; and V himself, always inside the mask. All this is punctuated by extremes of violence and V's extravagant flights of theatrical verbosity (including but not limited to a song, a verse from which opens this post); but the overriding visual mood is despair, for much of the time. The words, meanwhile, are reserved solely for the characters' dialogue and interior worlds: there are no sound effects, no explanatory captions (beyond the titles of the instalments - each beginning with the letter V - and brief date/location markers), just the good guys, the bad guys, and their lonely, desperate thoughts. (Not, of course, that anyone really fits into such straightforward categories; as V notes at one point, "Everybody is special. Everybody is a hero, a lover, a fool, a villain."). V, we learn, is a broken-and-reconfigured man, victim of a secret government concentration camp named Larkhill, where social undesirables (non-whites, Jews, gay people) were taken to be experimented upon until they died. He alone escaped - explosively - and now he is driven by revenge. At first his vengeance is directed against those directly involved in the camp. With those individuals murdered, however, he turns his masked gaze upon a bigger target, the system that gave birth to the camps. Since mankind's dawn, a handful of oppressors have accepted the responsibility over our lives that we should have accepted for ourselves. By doing so, they took power. By doing nothing, we gave it away. Tomorrow, Downing Street will be destroyed, the head reduced to ruins, an end to what has gone before. Tonight, you must choose what comes next. Lives of our own, or a return to chains. Vaulting, veering, vomiting up the values that victimised me. Feeling vast. Feeling virginal... Was this how he felt? This verve, this vitality... this vision. The only course open is to resist: to cling on to integrity, and principles, and freedom, for dear life and beyond. Of course, the vision of how such freedom and integrity can be achieved is somewhat... uncompromising. Everything must be reduced to rubble before it can be rebuilt - a principle that applies equally to people. Time and again we see characters reach their apotheosis by having everything stripped away from them, until the only thing that matters is that freedom - the freedom to resist, to refuse to conform, to remain true to oneself. The freedom to, as Winston Smith would have it, say that two plus two equals four - even if it means dying, for "Ideas are bulletproof". He imposes this, shockingly, upon his protegee Evey, letting her believe she has been captured by the police, subjecting her to imprisonment and interrogation, until she emerges, shaven-headed and shell-shocked - and with a new conviction. I didn't put you in a prison, Evey. I just showed you the bars. [...] You're in a prison, Evey. You were born in a prison. You've been in a prison so long you no longer believe there's a world outside. You're afraid, because you can feel freedom closing in upon you. You're afraid because freedom is terrifying. It is strange that my life should end in such a terrible place, but for three years I had roses and I apologised to nobody. I shall die here, every inch of me shall perish... Except one. An inch. It's small and it's fragile and it's the only thing in the world that's worth having. We must never lose it, or sell it, or give it away. We must never let them take it from us.